This won’t be a long post. Why is that? Well, let’s see…I happened to pick TWO dishes to make from scratch tonight without really thinking through the process. On top of that, they were two recipes I’ve never tried before. On top of that, I got home 30 minutes late. On top of that, I forgot how many steps these recipes had. On top of that, my kid put his toothbrush down the sink drain. On top of that, I had to empty the dishwasher before I could even start cooking. Bottom line: these recipes were great, but they definitely took some effort. My suggestions? Save these recipes for a day when you have time to focus. Or, at least pick a day when your kid isn’t feeling adventurous with the sink drain. Warning: there are no “process” photos because of all the reasons I listed at the beginning of this paragraph. 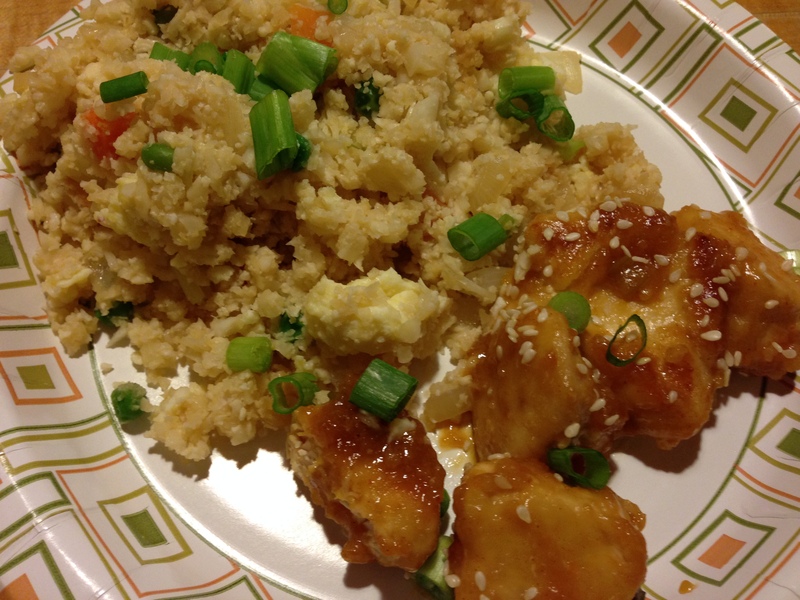 First up: Skinnytaste’s Orange Chicken Makeover. Couple of notes: My version’s sauce was a little too thick, so I would back off some of the cornstarch next time. Otherwise, it was hard to believe the chicken dish was only 8 points. 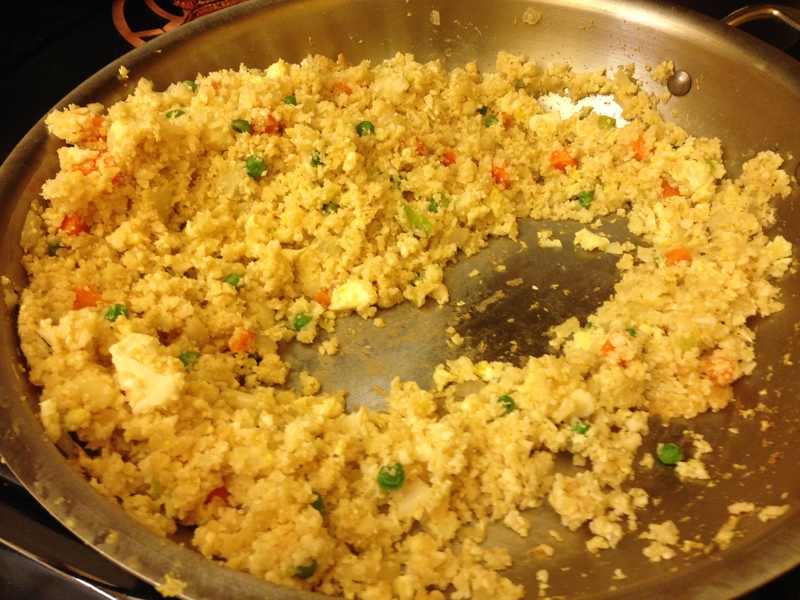 Next up: Skinnytaste’s Cauliflower “Fried Rice.” I know what you are thinking. You are thinking, “Amanda, this Weight Watchers thing is going to your head. Cauliflower is NOT rice.” Annnnnnd you would be absolutely right. Cauliflower is not rice. However, cauliflower totally WORKS in this recipe — you know, in Weight Watchers land. In fact, there was some shock at the dinner table tonight. I don’t know if I should take it personally when my husband repeats “how surprised he is at how good the recipe turned out” more than, oh EIGHT times. Caveats: This dish takes some effort, so be prepared. It probably felt effortful because I paired it with the chicken and I absolutely burned the sesame oil at midway through that dish, so there was that. Best part? You can have 1 AND 1/3 cups of it for only 3 pts. Shhhhhhhhhh. Do you hear that? Those are angels singing in celebration of large portions. It happens in my mind every now and then. So, there’s tonight’s dinner. Total points = 11. Total prep/cooking time: Approximately an hour? So, just remember to make some time for this one and you won’t be sorry. You can also skip bath time to make up for time lost. I’m down another pound, which means I’ve lost 14.2 pounds so far. Go, Cauliflower, Go! Sorry for all your troubles! This looks fantastic and the portion size makes me want to do back flips! Definitely trying this recipe. Thanks!